Whenever I work through an antique pattern, my thoughts inevitably turn to another knitter, long gone and utterly forgotten, who may have pursued the same course of knits and purls when The Workwoman’s Guide or The Knitter’s Friend were still hot off the press. 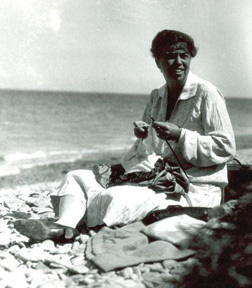 This month, for a change, we’re going to play with a pattern written down in the last century by a knitter who is anything but anonymous or forgotten: Eleanor Roosevelt -- author, activist, and wife of Franklin Delano Roosevelt, the thirty-second president of the United States. She was also, as it happens, a knitter. Not long ago, two manuscript knitting patterns were discovered among her papers by Mary Ann Colopy, a seasonal park ranger at the Roosevelt/Vanderbilt National Historic Site in Hyde Park, New York. Mary Ann, who is herself a knitter, generously offered me the opportunity to test and translate them. She was also kind enough to chat with me at length about her work in preserving and sharing the legacy of Eleanor Roosevelt. Franklin: So, what it’s like to work at a place like Hyde Park? What exactly do you do? Mary Ann: As a seasonal park ranger, I’m a historic interpreter. It’s like being a teacher. I research, develop and present tours of the four sites that comprise the Roosevelt-Vanderbilt National Historic Site: the home of Franklin D. Roosevelt, Top Cottage, ValKill (the Eleanor Roosevelt National Historic Site), and the Vanderbilt Mansion. I also present school programs and have developed programs for special groups, and special events. My goal is to make the story of the people I am talking about change something for the visitor. They can be touched emotionally, or intellectually, or just have a good experience with their families; everyone leaves with something to talk about. Franklin: What attracted you to that line of work? Mary Ann: I like a good story, so that drew me to social history. Working in historic house museums, you are surrounded by everyday stuff, and every object can tell a variety of stories. A house museum that has been relatively untouched since its occupants left, like Franklin Roosevelt’s; or has rich documentation, like Eleanor Roosevelt’s, is just like your house or mine. The personality of the occupant is stamped in the choices made for furnishings, decorations, the style of the house. I think it is fascinating that we can “read” these houses and objects and learn another facet about the owners that may not be revealed in their writings. Franklin: And how did you become interested in Eleanor Roosevelt? Mary Ann: I’m interested in women’s history, and the motivations of people who participate in reform movements. Only about ten percent of historic sites in the United States are devoted to women’s history, so the chance to work at ValKill is wonderful. Franklin: What can you tell us about Mrs Roosevelt as a knitter? Mary Ann: In her autobiography, she writes that when she was five or six, her nurse cut holes into the socks she had knit so that she would learn how to darn heels properly. Considering the number of pictures of Eleanor knitting, and the comments by others about her constant knitting, she herself wrote practically nothing about her knitting. Her “My Day” newspaper columns mention her own knitting less than ten times in almost 8,000 installments. The pattern collection in the Roosevelt Library has things for babies and children, and many raglan pullovers for her grown sons. I have seen reference to her knitting a sweater for her friend Lorena Hickok,* and sweater measurements for her friend Earl Miller. Franklin: As part of her work in support of the Allied forces in World War II, did she become involved in any of the wartime knitting programs? Mary Ann: This is something I am continuing to research. In some autobiographies, it is stated that she organized Navy wives to knit during World War I. However, I have not been able to find evidence that she was the organizer. In her own autobiography, she says she participated in war knitting–every spare minute. But the New York Times articles I have read do not list her among the organizers of the Navy Comforts Committee. Apparently there was squabbling between different aid groups, and she may have been involved in a group I have not yet found. I haven’t yet read her personal letters -- her handwriting is terrible -- but I plan to begin searching them beginning with letters to her mother-in-law in 1917. She was famously shown promoting knitting at a tea at the Waldorf Hotel in September, 1941. Americans had been knitting for several years as part of the “Bundles for Britain” effort, and this tea was to encourage production for American armed forces. During World War I, hand knitting was readily used by the armed forces, as it had been during the Civil War. But during World War II, there appears to have been concern about hand knitters diverting materials from commercial mills. Again -- I am continuing to research this. Franklin: Are there any extant examples of her knitting to be seen in public collections? Mary Ann: The one piece that is on display in the Eleanor Roosevelt wing of the Franklin Delano Roosevelt (FDR) Library is an army green raglan pullover that she made for her friend Joe Lash while he was in the service. Not on display, but in the FDR Library collection, are knitting needles, needle cases, and knitting bags -- but no other pieces of knitting. There are some small pieces of embroidery, a pair of needlepoint slippers, and a woven vest embroidered by Eleanor for Franklin. In the ValKill cottage, on display, there are blankets with embroidered monograms, hardanger embroidery tablemats, and a reproduction of a knitting bag given by Eleanor to one of her nieces. Franklin: How did you discover her handwritten knitting patterns? Mary Ann: Eleanor Roosevelt’s papers are held in the FDR Library. The knitting patterns are under the subject “Hobby.” But originally those from the White House years were separated from the pre- and post- years. At the top of some patterns was the drafter’s name, and then I had to look in the correspondence files to find related letters. 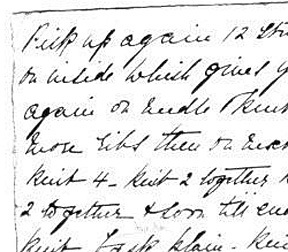 It was in the letters that I uncovered a lot of interesting information, such as Eleanor wanting a particular shade of blue yarn, or asking for another sweater pattern written out with different measurements. Franklin: What was your reaction when you found them? Mary Ann: I was surprised that there was so little information, considering that Eleanor was a lifelong knitter. Franklin’s hobby of stamp collecting generated many articles and several books. But after thinking about it, several things stand out as possible factors. When Eleanor died in 1962, her place in history had not yet been determined. The contents of ValKill Cottage were sold at auction, and the property converted to apartments. Unless a family member wanted some of the knitting artifacts, they most likely would have been thrown out. She was not a designer. She knit because she could not sit still. Her projects were very utilitarian, and would have been worn and then discarded. One reason some things were saved is that they were inside a piece of furniture that was not emptied until the Eleanor Roosevelt wing of the library was constructed! Eleanor’s knitting was something she did for herself, to feel active even when sitting. She would ask other knitters for patterns, and share patterns with other knitters. But outside of the world of women producing garments for their families, the patterns and artifacts were not appreciated. And this is still true in many ways for knitters. Knitting is a folk art, passed from hand to hand. Unlike many textiles -- such as lace, quilts, weaving, and samplers -- it has not received academic attention until very recently and has not been appreciated as a craft. Franklin: Do you see Mrs Roosevelt as a role model for modern men and women -- and knitters? Mary Ann: As I have read more about her, and read her writings, I have found her to be a very complex person. Although she came from the elite class, her personal life was unhappy. Her childhood was very difficult emotionally, and the coping skills she developed early on made her adult relationships difficult. Her marriage was a disappointment, and her children trying. But she found her satisfaction in work, she said it could feed the soul. As she became a public figure, she traveled the world as an advocate for human rights. However, she said that human rights begin in small places, too small to see on a map. That is -- in back yards, in playgrounds and schools, workplaces and towns. It begins with individuals making a difference in their own communities. Eleanor was largely self-educated: she learned to listen and ask questions, to be genuinely interested in people. How does that relate to knitting? When one knits in public it attracts attention, and conversations begin. Even better if the conversation can be about the charity knitting one is doing. 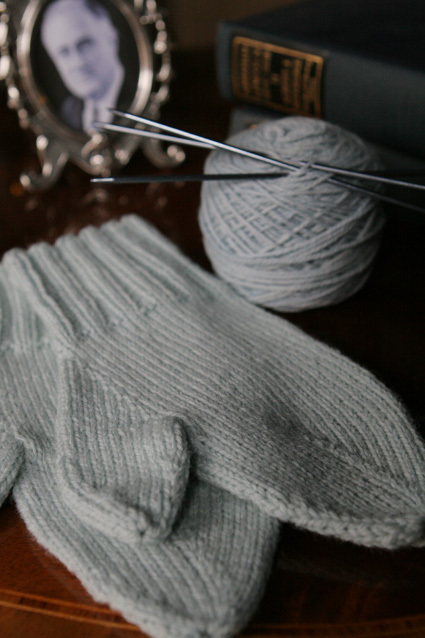 The end result is the mitten pattern that follows. The manuscript was refreshingly straightforward to work from, although the shaping for the thumb is pure conjecture, as the notes end with the instruction to pick it up on three needles. 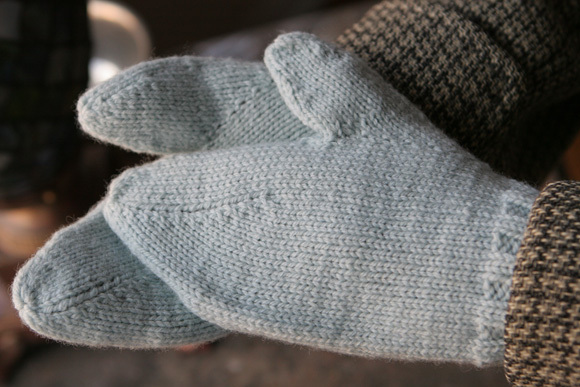 Like much of Mrs Roosevelt’s knitting, these mittens are decidedly utilitarian: easily made, easily memorized -- perfect for a busy knitter with a large family given to using, losing, and wearing out their winter gear. *An American journalist who, according to some historians, may have become romantically involved with Eleanor. Translated by Franklin Habit from unpublished notes in the Eleanor Roosevelt Papers of the Franklin Delano Roosevelt Presidential Library. Mrs. Roosevelt's pattern calls very specifically for double-pointed needles, and therefore we have kept it that way. It is easily converted to magic loop or two circulars, if you wish. We like to think that Mrs. Roosevelt would have been intrigued by these new innovations in knitting. Note: These are the two sizes -- equivalent roughly to a modern Adult Women’s Small and Medium, respectively -- accounted for in Mrs. Roosevelt’s notes; but the underlying method is so simple that adjustments for larger or smaller sizes can easily be made. Make two -- or three, if the intended recipient is inclined to be absentminded. CO 48 sts, distribute evenly on 3 ndls (16  sts per ndl). Join to work in the round, being careful not to twist. Rounds begin on needle 1. Round 1: [K2, p2] to end of round. Repeat Round 1 until work measures 3  inches from CO. Round 1: N1 -- k8, m1, k8 (17 sts). N2 and N3 -- knit. 49 sts. Round 4: N1 -- k8, m1, k1, m1, k8 (19 sts). N2 and N3 -- knit. 51 sts. Round 7: N1 -- k8, m1, k3, m1, k8 (21 sts). N2 and N3 -- knit. 53 sts. Round 10: N1 -- k8, m1, k5, m1, k8 (23 sts). N2 and N3 -- knit. 55 sts. Round 13: N1 -- k8, m1, k7, m1, k8 (25 sts). N2 and N3 -- knit. 57 sts. Round 16: N1 -- k8, m1, k9, m1, k8 (27 sts). N2 and N3 -- knit. 59 sts. Round 19: N1 -- k8, m1, k11, m1, k8 (29 sts). N2 and N3 -- knit. 61 sts. Round 22: N1 -- k8, m1, k13, m1, k8 (31 sts). N2 and N3 -- knit 63 sts. Round 23: N1 -- k8, sl next 15 sts to scrap yarn, CO 5 sts, k8. N2 and N3 -- knit. 53 sts. Round 25: N1 -- k8, sl1-k1-psso, k1, k2tog, k8. N2 and N3 -- knit. 51 sts. Round 26: N1 -- k7, sl1-k1-psso, k1, k2tog, k7. N2 and N3 -- knit 49 sts. Round 27: N1 -- k7, k3tog, k7. Needles 2 and 3–knit. 47 sts. K all sts until work measures 4 inches from top of ribbing or until mitten is 3 inches short of desired length to tip of longest finger. Round 1: N1, N2 and N3 -- k2tog, k to end. Repeat these two rnds until 15 sts remain. Break yarn leaving a long tail and run through all sts. Pull top of mitten closed an weave in yarn end on WS. Slip 15 reserved sts at thumb gore from scrap yarn to ndl. With second ndl and yarn, pick up and knit 9 sts along the top of gore opening (24 sts total). Distribute sts evenly onto 3 ndls (8 sts per ndl). Rounds 1–8 (or until thumb is 1 inch short of desired length): Knit. Round 9: N1, N2 and N3 -- k2tog, k to end. Repeat Rounds 9 and 10 until 8 sts remain. Break yarn leaving an ample tail and run through all sts. Pull top of thumb closed and weave in yarn end on WS. Wash according to yarn manufacturer’s instructions, and gently block to shape. 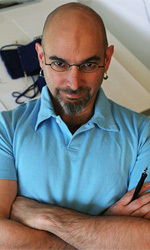 Franklin Habit is a knitter, writer, illustrator and photographer who lives in Chicago. His first book, It Itches: A Stash of Knitting Cartoons , is available from Interweave Press.